By creating an account, you will be entitled to access the CCSD services like HAL Sciencesconf.org and Episciences.org. By filling up your profile, you will be able to use all functions. You can search HAL without being registered. Opening an account with the CCSD’s Central Authentication Service. Enter the required information: login (user name), password, identification (Family Name, Given Name, and email). You will not be able to change your login. Confirm the creation of your account by clicking on the link in the email you receive (check if this email has not been filtered out in your spam folder). Once your account is created, you can log in to HAL. 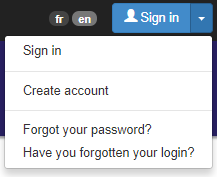 NB: While being valid for HAL, your login/password is also active on Sciencesconf.org and Episciences.org. The chosen informations will appear on each new submission. However it will be editable on your submission. Submission form : the simple view will only show the required fields and the list of metadata loaded ; the detailled view show all the metadata. Add me as author : if you submit your own publications, select to “yes” so that the author’s metadata is already completed. HAL will automatically send you emails. You can choose not to receive them by setting your alert preferences. Receive the confirmation of your submission : an email is sent each time you make a submission. Receive the notifications when you are identified as a co-author : an email is sent each time your name is used in a new submission. This submission may have been done by your co-authors or by a professional reserchers from your laboratory. If you check the box you will be notified when one of your publications is available on HAL. The received email will allow you to confirm if you are the author of the publication : the submission will be in your space and you will be able to modify/complete it. The received email will also give you the opportunity to deny the publication as the author. your research structure if you are a referent. If you are the referent of multiples structures, you will be able to make a finer selection. your portal if you are a portal’s manager. To edit your HAL account or profile, go to My space/My profile/Modify my profile. To edit your password, go to My space/My profile/Modify my password. if you have forgotten your login, you can request for it to be sent to your HAL email account. 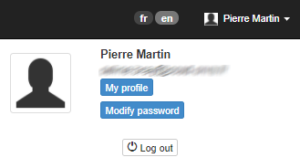 if you have forgotten your password : you can create a new one easily if you indicate your login. You will receive an email with a reset password link. NB : If you do not receive an email, please contact our support team at hal.support@ccsd.cnrs.fr. We will update your account and sent you your forgotten login and a reset password link.